Linda's Angels: $1000 Apple Or Amazon Gift Card - What A Great Giveaway!!! 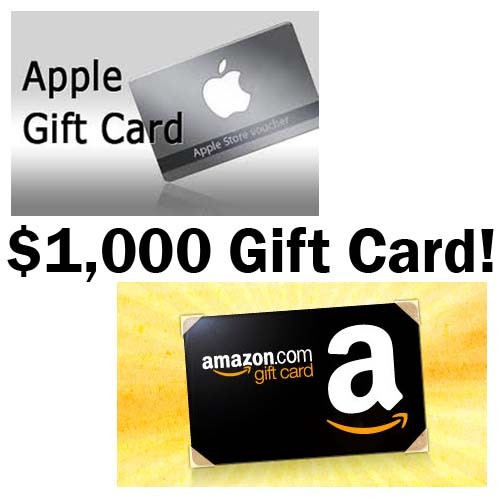 $1000 Apple Or Amazon Gift Card - What A Great Giveaway!!! Here Is One Terrific Giveaway!! We Have Revised This Giveaway To Give The Winner Their Choice Of The Apple Or Amazon Gift Card! Enter To Win A $1000 Apple / Amazon Gift Card - Just Imagine What You Could Buy! Maybe New iPad 64 And Even A New iPod Touch! Definitely Do Not Miss Out On This One & Follow The Rafflecopter Form Below And Enter!! OMG this is the best giveaway, I need a new phone and laptop for my job so bad. I am praying!Thanks so much!